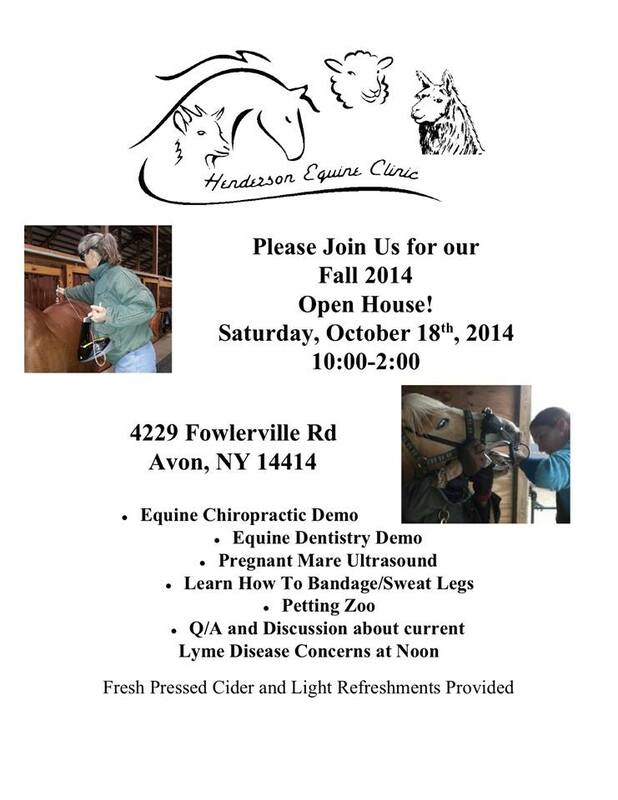 Equine Rehabilitation Therapy Demo Morning! 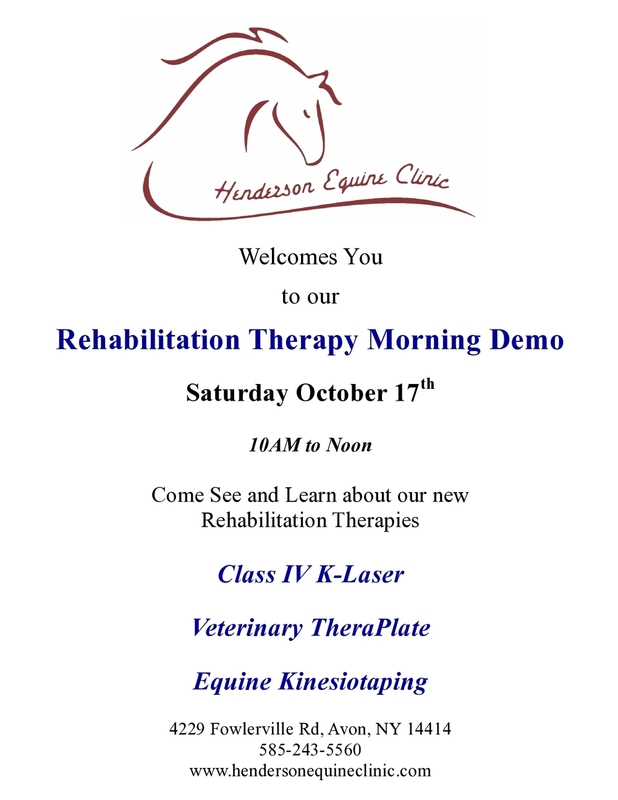 Stop by and see us at the clinic Saturday, October 17th from 10a to Noon to learn about our Equine Rehabilitation Therapies. We are excited to be now offering complimentary physical exams for newly Off The Track Thoroughbreds and Standardbreds. We appreciate how talented these horses can be in their new careers and want to help them get off to their best start possible! We are now working with Kentucky Performance Products to offer their veterinary formula line of supplements. We have always utilized their Summer Games Electrolytes and are very excited about their new Breathe Wise product as an additional tool to manage allergic airway disorders in horses. With this very wet spring we have had, there has been a confirmed case of Potomac Horse Fever in Livingston County in a horse that has not traveled out of the area. Potomac Horse Fever causes diarrhea, fever, and potentially laminitis from bacterial endotoxin release. It is spread by a combined life cycle involving snails/slugs and mayflies or other insects that lay eggs in water. It is typically seen as the temperatures increase in the summer, so there is a concern that more cases may crop up now that Neorickettsia risticii has been confirmed in the area. There is a Potomac Horse Fever vaccine available which offers some protection. We would love to discuss vaccination or prevention strategies for your horses via email hendersonequine@gmail.com or phone 585-243-5560. The FDA has approved a new Hyaluronic Acid drug (NexHA) for IV use in horses. This adds a second HA intravenous treatment option to our equine joint health and maintenance program. Please contact us for more information on this additional treatment option! Syracuse, N.Y. -- A horse in southern Oswego County has died of Eastern equine encephalitis virus, the first reported EEE horse death this year in the state. The Oswego County Health Department said the horse had been stabled near an area known to harbor the EEE virus in Oswego and Onondaga counties. The horse was probably exposed to EEE in late July, prior to the aerial spraying of the Toad Harbor - Three Mile Bay Wild Management Area, according to the department. Horses are very susceptible to EEE if they are not vaccinated. About 70 percent to 90 percent of all all horses infected with the virus die. No documentation has been found to indicate if horse had been properly vaccinated against EEE, according to the health department. EEE is carried by mosquitoes. While there is a vaccine for horses, there is no human vaccine available to the public. Human cases of EEE are rare, but very serious. About one-third of people infected with EEE die. An Onondaga County resident recently diagnosed with EEE is recovering from the virus. Five people in Central New York have died of EEE since 1971. Both Oswego and Onondaga counties have recently done aerial spraying to combat mosquitoes. Onondaga plans to do ground spraying Monday and Tuesday in neighborhoods near the Cicero Swamp. Jiancheng Huang, Oswego County's public health director, said more evidence of EEE was recently found in mosquitoes collected from the Toad Harbor-Three Mile Bay area. "People need to be very careful about limiting their exposure to mosquitoes until later in the fall when there is a killing frost," Huang said. The health department advised residents to use mosquito repellent when outdoors and take other protective measures. NY Ag and Markets offering $15 EEE vaccine rebate through March 31st! 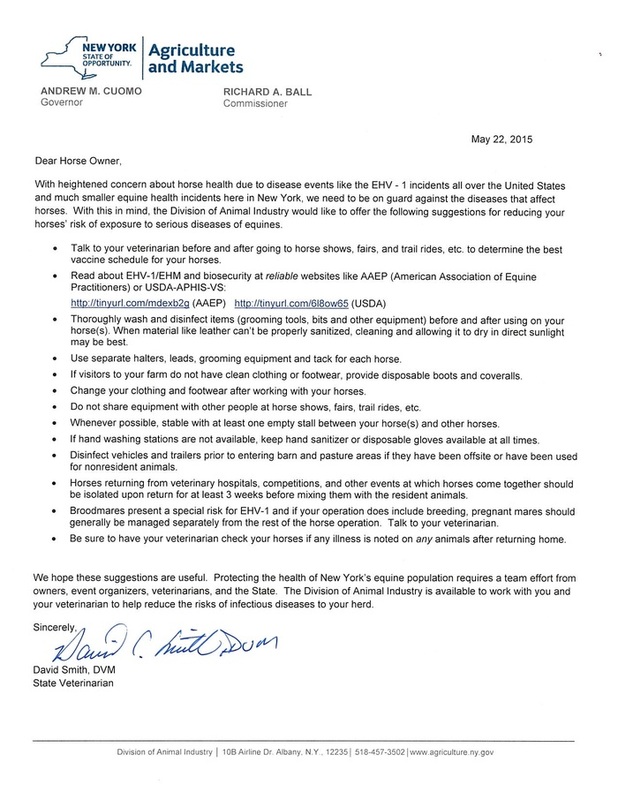 ATTENTION HORSE OWNERS: NY Department of Ag and Markets is offering a limited number of $15 rebates on spring vaccinations that include Eastern Equine Encephalitis (EEE). To qualify vaccines must be administered by a veterinarian between January 1st and March 31st. We will be offering these on a first come, first served basis! Call the clinic at 585-243-5560 to schedule an appointment. By Sally Fox Livingston County News. The last 12 months have brought many changes for the Henderson Equine Clinic, which has experienced a trifecta of exciting advances in its ability to provide quality services for both equines and small ruminants. A year ago this month, Dr. Anne Dewar joined Dr. Bonny Henderson, who established her veterinary practice in the Valley after achieving her doctor of veterinary medicine degree at Cornell in 1994. Originally from the Saratoga area, Henderson first came to the Valley as an undergraduate at SUNY Geneseo, where she expanded her equestrian experience to include the joys of foxhunting under the tutelage of Judge J. Robert Houston and Dan Wade. Dewar discovered the area in part through her affinity for small ruminants, coming to know Matt Kyle who owns the sheep seen grazing in various locations in the northern part of Livingston County. Dewar spent her first two years in practice at Finger Lakes Equine with Dr. Bob Tugel at Finger Lakes Racetrack after gaining her DVM degree at Virginia-Maryland Regional College of Veterinary Medicine, a collaboration between Virginia Tech and the University of Maryland spread over three campuses that specialize in sports medicine, research, and surgical practices. Coming from an equestrian background in pleasure and endurance riding, Dewar has now become an avid foxhunter as well. In the equine field, her specialties are lameness and reproduction, though she also feels a special fondness and calling in working with smaller multi-stomached livestock such as sheep, alpacas, goats, etc. The next big development in 2013 was last fall’s move of the clinic from its original location on Groveland Road near the Interstate 390 overpass to a 20-acre piece of an old dairy farm on Fowlerville Road in Avon. Renovations on the old barn are still in progress and will eventually include a small indoor ring for assessing soundness and other practical uses. For now, there is a spacious exam area, well-equipped laboratory, three treatment stalls, stocks and ample parking for all sizes of livestock transports. In the technology realm, the clinic is now offering K-Laser Class IV therapeutic laser treatments for advanced pain relief and enhanced tissue healing. Although the K-Laser is being used by numerous veterinary health care providers throughout the U.S and the world, the Henderson Clinic is unique in this area with offering this service. Laser therapy works by stimulating production of cellular energy in damaged cells and by enhancing the cell membrane permeability. This promotes the speed and quality of healing, enhances the exchange of nutrients and wastes across the cell membrane and improves the elasticity of injured tissues. Laser therapy also modulates pain and reduces inflammation. It can be used immediately on acute injuries, over broken skin, and over metal implants. Laser therapy enhances the rate and quality of injuries and can help with the resolution of chronic complaints such asarthritis. Perhaps best of all, the actual instrument itself is battery-powered, relatively small, and light enough to be easily handled and focused. For more information on the K-Laser, visit the company website at www.k-laserusa.com. Picking up the weighty tome, I was immediately impressed by the scope of the 20 chapters, as well as the numerous, top-quality, color photos and illustrations. “Equine Health and Emergency Management” provides essential knowledge in all aspects of horse care. 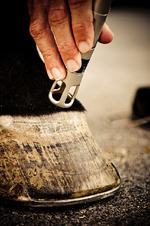 The book begins by emphasizing the importance of horsemanship in the prevention of injury and disease. Key factors of facility safety and stable management are identified as essential in equine ownership, as is a thorough understanding and knowledge of the healthy horse, broodmare, and foal. Once this essential knowledge base is achieved, the book progresses to discussion of preparing for and managing emergencies. Assessment and treatment skills are addressed. Diseases and trauma of each body system are also covered outlining the clinical signs, vital signs, history or possible causes, actions to take, and prevention strategies for each. The book concludes by addressing the assessment, planning, and preparation needs when faced with man-made or natural disaster. Published by Centage Learning in 2012, the book was obviously a prolonged labor of love. It is available on Amazon, and would no doubt be a worthy addition to any horse owner’s library — or better yet — tack room. Thanks to the Livingston County News and to Sally Fox for this very nice article. Henderson Equine Clinic's New Christmas Present! A Cube4 K-Laser! We are excited to announce that we are now utilizing a Class 4 Therapeutic Laser system from K-Laser as an additional therapy for our patients. Laser Therapy or "photobiomodulation", is the use of specific wavelengths of light (red and near infrared) to create therapeutic effects. These effects include improved healing time, pain reduction, increased circulation and decreased swelling. Laser therapy has the potential to have MANY beneficial effects and you may have seen or heard some seemingly outrageous claims over the years with regards to what lasers can do. Bio stimulation and tissue regeneration are the first effects cited in much of the literature. So what does this do for the patient? The effects of red light on cellular function have been known since 1880 however the clinical benefits were only discovered by accident during laser safety tests in 1967. The first low-power lasers suitable for treating pain became available commercially in the late 1970's and ever since then, laser therapy has been widely utilized in Europe by physical therapists, nurses and doctors. Now, after FDA approval in 2001, laser therapy is quickly gaining popularity in the USA. Dr Bonnie is very excited to be able to offer laser therapy to her chiropractic, especially to help relax muscles and decrease inflammation in areas that the patient may dislike having adjusted. For her accupuncture clients, she is able to utilize a setting on the Laser that is used to stimulate accupuncture points, allowing accupuncture treatment of needle shy animals, or of points that may be difficult to place needles. Dr Anne has been using therapeutic laser treatments on some of our older arthritic patients and has been seeing improved movement and decreased pain! She's very excited to have laser therapy available to the equine athlete portion of our patient population as well, and will be using laser therapy as an adjunctive treatment for sports medicine conditions. We will also be offering laser therapy to help speed wound healing and decrease the formation of proud flesh and scar tissue! Changes to USEF and FEI Drugs and Medications Rules for 2014! a. Therapeutic fluids, which amount must consist of a minimum of 10L of polyionic fluids; and which must be used in accordance with the manufacturer's recommendations and guidelines. The fluids must not be supplemented with concentrated electrolytes, such as magnesium. 2. The above exceptions are permitted only when (i) the substance is administered by a licensed veterinarian and no less than six hours prior to competing; and (ii) the "Trainer" as defined under General Rule 404 properly files, or causes to be properly filed, an Equine Drugs and Medications Report Form with the Steward/Technical Delegate or competition office representative within one hour after the administration of the substance or one hour after the Steward/Technical Delegate or competition office representative returns to duty if the administration occurs at a time outside competition hours. The Steward/Technical Delegate or competition office representative shall sign and record the time of receipt on the Equine Drugs and Medications Report Form. • No horses or ponies may be injected within twelve hours of competing. • There are only three exceptions to this rule: therapeutic fluids, antibiotics, and Dexamethasone (for the treatment of hives). • All excepted substances must be administered by a veterinarian and cannot be administered to a horse or pony within six hours of competing. • Dexamethasone (Azium®) - maximum 24 hour dose has been decreased from 20mg/1000lb horse to 10mg/1000lb horse and must be administered in accordance with the new "12 Hour Rule" GR414. • Ketoprofen (Ketofen®) - maximum 24 hour dose 1.0 gram/1000lb horse remains the same, however it must be administered within 12 hours prior to competition. • Methocarbamol (Robaxin®) - maximum 24 hour dose 5.0grams/1000lb horse remains the same, however must be administered within 12 hours prior to competition. The new competition year begins December 1, 2013. The USEF encourages every exhibitor, trainer, coach, and owner to take time, prior to competing, to carefully review the "Guidelines for How Long Drugs Remain Detectable" which is included in the 2014 USEF Drugs & Medications Guidelines and can be accessed by clicking here or by contacting the USEF Drugs & Medication Program atMedequestrian@aol.com. You may also call the USEF Drugs & Medications office at 800-633-2472 to request a copy. Concerned about reports of mosquito carried diseases such as Eastern Equine Encephalitis, or West Nile Virus cropping up in Western New York? If you vaccinated your horse this spring, consider boostering them with a 3way vaccine (Eastern, Western, and Tetanus) with West Nile Virus for the fall mosquito season. If you haven't had your horse's annual vaccines done, NOW is the TIME! NY State Ag and Markets is offering a $15.00 rebate on Encephalitis vaccination for horse owners through September 30th. We have a limited number of rebates available and are offering them on a first come first serve basis. The Livingston County Department of Health reports that a skunk killed in northeastern Livingston County has tested positive for rabies. The skunk attacked a litter of kittens in the front yard of a Lima home during daylight hours on July 29. A resident of the property killed the skunk and submitted it to the Health Department for analysis. “Although the incident occurred in the Town of Lima, rabies can be found throughout Livingston County,” said Dan Bowlds, senior public health sanitarian for the Department of Health. The Department of Health learned July 31 that the sunk was positive for rabies. The news was announced Aug. 20 in a news release from the Department of Health. Rabies is a deadly virus that attacks the central nervous system of mammals. It is largely found in raccoons, foxes, skunks, and bats in many areas, including Livingston County. Other mammals, including unvaccinated dogs and cats, are at risk for getting rabies. State law requires that all dogs, cats and ferrets be vaccinated at 4 months of age. The Health Department reminds residents that caution should be taken around any unfamiliar animals. Wild animals especially should be avoided. Signs of rabies in wildlife can include: inability to walk, appearance of “drunkenness,” unwillingness to drink water or eat, frothing at the mouth, aggressive behavior and/or a massive swing in temperament. The best form of defense for keeping your pet safe is to keep them vaccinated. An unvaccinated pet that comes into contact with a rabid animal must be kept in strict confinement for 6 months or euthanized. — Teach children to stay away from unfamiliar animals, wild or domestic, even if they appear friendly. — Wash any wound from an animal thoroughly with soap and water, and seek medical attention immediately. — If your family or your pet has been exposed to a bat, capture the bat and have it tested for rabies. If you awaken to find a bat in your bedroom, or a bat is present in the room of an unattended or sleeping child or in a room where someone has a mental impairment, seek medical advice and have the bat tested. — Be a responsible pet owner by keeping your pet’s vaccinations current. A free rabies clinic for dogs, cats and ferrets is scheduled Sept. 17, 2013 at the Livingston County Highway Department complex at Hampton Corners. If you have any questions or would like further information on rabies, please contact the Livingston County Department of Health at 243-7280 or 335-1717. State Agriculture Commissioner Darrel J. Aubertine, State Health Commissioner Nirav R. Shah and State Gaming Commission Acting Director Robert Williams today urged horse owners across New York State to vaccinate their horses against Eastern Equine Encephalitis (EEE) and West Nile Virus (WNV). In 2012, two cases of EEE were reported in horses in New York State, as well as seven WNV cases. No confirmed cases of either disease have been reported thus far in 2013. While it is preferable to vaccinate horses against these diseases in the spring before the mosquitoes that transmit them are active, early summer is not too late, since New York often has mosquito activity into the month of November. Vaccines for EEE and WNV can be effective for six to twelve months, and horses should be re-vaccinated at least annually. In an area where the diseases occur year round, many veterinarians recommend vaccinations every six months. For the vaccine to be effective, it must be handled and administered properly, prior to an anticipated increase in mosquito activity in a local area. For these reasons, state veterinarian David Smith recommends that the vaccines be administered by a veterinarian. Other prevention methods include eliminating standing water breeding sites for mosquitoes, using insect repellents and removing animals from mosquito-infested areas during peak biting times, usually from dusk to dawn. In addition, water in water troughs should be changed at least twice a week to discourage mosquito breeding. There is no human vaccine for EEE or WNV. The best way to protect yourself is to keep mosquitoes from biting you. EEE is rare but serious and can affect both people and horses. Five cases have been diagnosed in humans in New York State since 1971 and all have been fatal. Prior to 2009, there had not been a human case detected in the State in more than 25 years. WNV is more common than EEE and can also cause serious illness or, in some cases, death. Not all mosquitoes carry WNV, but human cases have been reported in counties across the State. In 2012, there were 107 reported human cases of WNV statewide, nine of which were fatal. To greatly minimize exposure to WNV and EEE, the New York State Department of Health (DOH) recommends that people take precautionary measures, such as wearing shoes, socks, long pants and a long-sleeved shirt when outdoors for a long period of time. People are also advised to apply appropriate mosquito repellent according to the label’s instructions and to remove all standing water from their property. Horsepersons working at New York racetracks, where large concentrations of horses are stabled, should especially heed the recommendation to have horses vaccinated and take necessary precautions to reduce the risk of EEE or WNV. The New York State Gaming Commission’s on-track staff is monitoring facility conditions and working with track management to reduce mosquito-infested areas. Humans cannot become infected by handling or being exposed to an infected horse. Horses cannot spread either virus to or from other horses, people or pets. From a veterinary perspective, mosquitoes transmit both diseases from birds to horses. Typical symptoms of EEE in equines include staggering, circling, depression, loss of appetite and sometimes fever and blindness. Clinical signs of WNV in horses include lethargy, weakness in the hind quarters, stumbling, lack of awareness, head tilt and head twitching, convulsions, circling, partial paralysis and coma. Horses exhibiting neurologic signs like those listed above need to be promptly reported by veterinarians to the State Department of Agriculture and Markets’ Division of Animal Industry at (518) 457-3502, in addition to the local health department. Horses suffering from neurologic problems must always be handled with extreme caution, since they may be unpredictable and there is also the possibility that Rabies may be the cause. Vaccines are available to drastically reduce the incidence of EEE and WNV in horses. We are now offering digital coggins for our clients horses. Digital or e-coggins utilize digital photos of your horse from the front and both sides, in addition to written descriptions. This decreases the difficulties of matching "non-artistic" drawings to your horses actual markings. We will also be able to save photos from one year to the next, provided there are no changes to your horse's identifying marks (new scars, dark grey to flea bitten, appaloosa's markings changing as they age), which will streamline coggins testing even more! We are now also able to e-mail your coggins to you for printing at your convience if you prefer rather than traditionally mailing a hard copy. This will also decrease the need for frantic faxes when coggins are misplaced during shipping or showing, as we can always e-mail a copy, without searching and scanning. There is no additional charge for digital coggins, and if you prefer a hard copy of your coggins, we can easily print out and mail a copy to you. We are very excited about offering this service, and would love to answer any questions you may have about it! Saturday 3/2/2013 Dr Dewar will be ultrasounding some dairy does for a 4H Goat Ultrasound Demonstration! Please call the office at 585 243-5560 for more information if your 4H'er is interested in attending! We had a great ultrasound demo on Saturday, with two lovely Alpine does to ultrasound. Both meat and dairy goat 4H'ers were present as we demonstrated pregnancy diagnosis using transabdominal ultrasound. Luckily both does were pregnant, and though they were too far along to accurately count the number of kids, we were able to estimate that two kids were seen on one doe, and atleast one kid was seen on the second doe. The 4Hers were able to see the ribs and spines on all kids, and placentomes (the attachment of the placenta to the uterus) on both does. Pregnancy diagnosis using ultrasound in goats, sheep, alpacas, and llamas is quick and easy. It can be done as early as 30 days post breeding, and between 35-50 days post breeding the number of fetuses can be counted. I look forward to pregnancy checking does, ewes, and female alpacas and llamas for our clients this year! The information from the demonstration can be found on our blog!